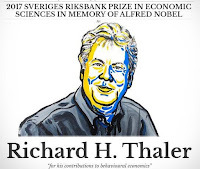 University of Chicago professor Richard Thaler won a Nobel Prize in economics on 9th October 2017 for upending the popular notion that individuals make rational choices about their futures and finances and developing policy solutions he believed could fix decision-making foibles. 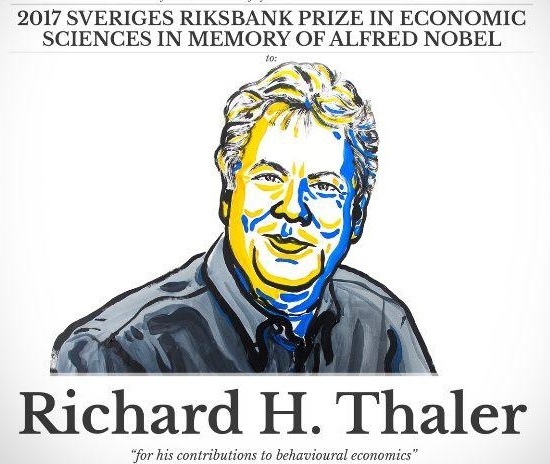 Richard Thaler co-wrote a bestselling book on the nudge concept read by politicians around the world and soon had them embracing the notion that people can be influenced by prompts – such as changing the wording of tax demands – to alter their behaviour. Nobel committee said the 72-year-old, who made a guest appearance in the 2015 credit crunch film The Big Short with Selena Gomez, has provided a “more realistic analysis of how people think and behave when making economic decisions.” Asked what he planned to do with his 9m krona (£840,000) prize money, Thaler joked that he intended to spend it “as irrationally as possible”, in a nod to his work showing how people’s choices on economic matters are not always rational. Nudging stems from the field of behavioural economics, examining how gut instincts can often overrule rational choices, in which Thaler is regarded as a pioneer.